Ever wanted to have those cool color swatches so your customer can easily choose the color or style of your product? Well now you can, and you don't have to create images for the swatches either! Just enter the hex code of the colors or upload the custom swatch images within your attributes options, set your swatch attributes and swatch size in the configuration, and you're done! The module will automatically create the swatches for all your configurable products! This version of the module will also change the product image and more views based on the swatch option selected! Features an easy to you use swatch panel to view, manage, and upload images for swatches and easy to use image selecting setup! Change main image and more view images based on swatch selection. 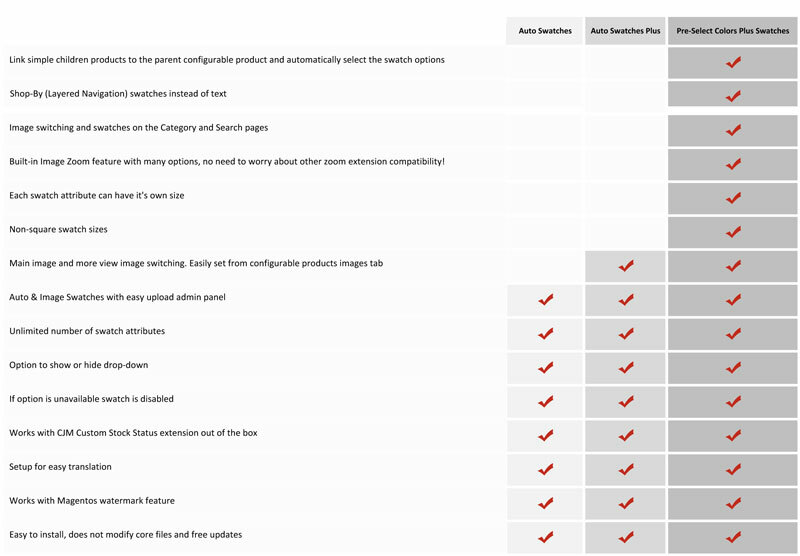 Simply upload all images to configurable product and then set options from image tab. Support for unlimited swatch attributes. Create as many swatches as you want for each swatch attribute. Can upload custom swatches like patterns via easy to use swatch panel. Works with configurable products only.